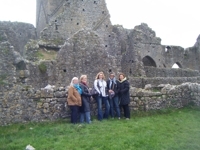 Had an incredible trip to Ireland with wonderful friends from N.S. We spent 6 days at Theresa Bourque’s Fiddle Retreat in Lower Shannon. Enjoyed learning some Irish Fiddle styles, jamming and sight seeing!!! What a great experience!!!! Now home to regroup and prepare for shows coming up! See some new ones added! Oh and the Christmas gig with Bowfire is NOT happening. will enjoy being home with family instead!!!! My new site IS coming ….. I promise!